N2N Gallery has been bridging the gap between Eastern Europe and the Middle East for a full year now, and their latest exhibition couldn’t be more fitting. N2N Gallery opened just over a year ago. Founded by Natalya Muzaleva, the space has two goals. First, it aims to provide a platform for artists who are well known in Europe to establish a more international presence. Second, the gallery wishes to introduce Abu Dhabi to the world of contemporary European art. In the past year, N2N Gallery has made great strides in these endeavours, welcoming more than 15 Eastern European artists and introducing new mediums to the UAE, including etching prints and enamel pieces, which involve painting metal surfaces with a special, glossy paint. The gallery is starting off its second year by expanding its gallery space within Emirates Palace and also hosting exhibitions in another venue: Avenue at Etihad Towers. To that end, prior to the exhibition, Kateryna spent four days creating artwork with a young Emirati girl, suffering from terminal illness. Kateryna conducted one-on-one masterclasses with Afra and the two produced work together, which is also on display at Etihad Towers. Kateryna has established an impressive reputation in Ukraine and the rest of Eastern Europe. A graduate of the Taras Shevchenko School of Arts in Kiev, a renowned arts high school in Ukraine, she has been working as an artist for almost 20 years and held solo exhibitions at several venues throughout Ukraine and France. 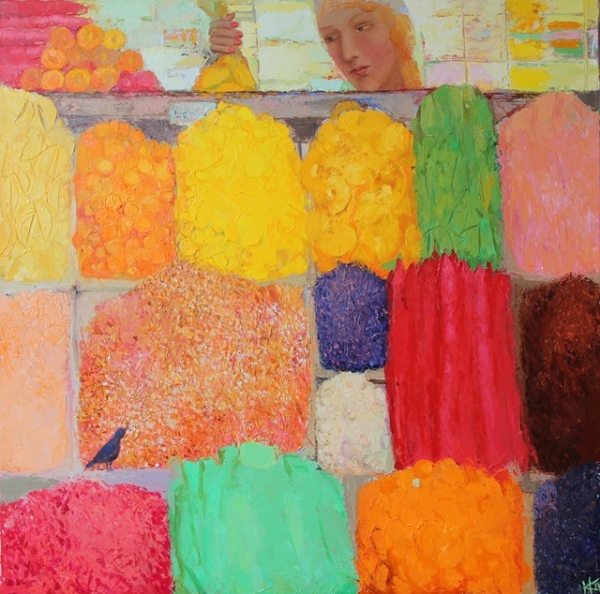 Working in the style of classical Ukranian artists, her paintings – large oil canvases exhibiting a heavy painterly stroke – depict images of sweeping landscapes and colourful still lives, both demonstrating a rich appreciation for the culture around her. 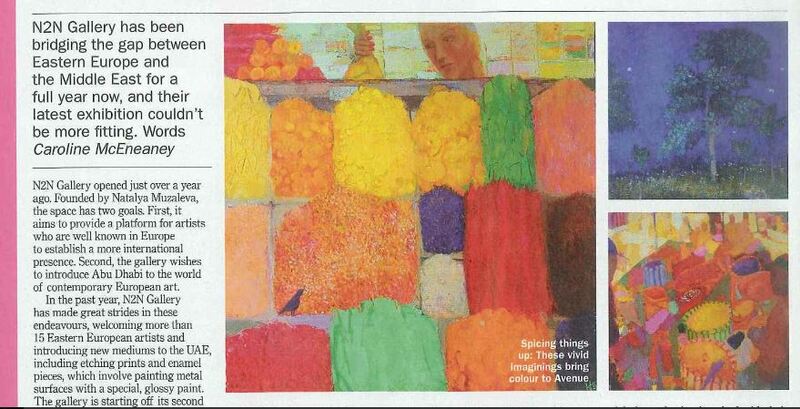 ‘Sweets and Spices’ primarily features Kateryna’s artful depictions of market stands – selling, you guessed it, sweets and spices. The frames overflow, each different spice and sweet represented with a unique colour and texture. In one painting, simply titled ‘Spices’, Kateryna frames the colourful, almost abstract sacks of spices with two carefully rendered people in the foreground. In the background, the round faces of the crowded market blend into the round colours of the spices for sale, mirroring the abundant offerings in the bustle of the shopping area. This collection, which combines the style and impressions of this Ukranian artist with the imagery and aesthetic aspects of the Middle East, mirrors the initial goals of Natalya and N2N Gallery, setting them apart from the other galleries in the capital that mainly focus on work by local artists. They are committed to contributing to Abu Dhabi’s developing reputation as a global arts destination. 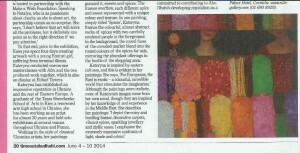 And with their forthcoming expansion, the gallery is looking to welcome more artists from more countries to the UAE. 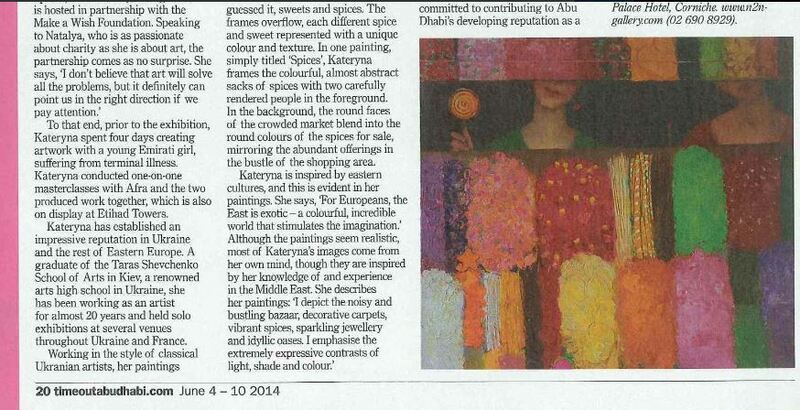 ‘Sweets and Spices’ will be on display until June 14. Prices available upon request. Avenue at Etihad Towers, Corniche West. For more information visit N2N Gallery in the Emirates Palace Hotel, Corniche. www.n2n-gallery.com (02 690 8929).